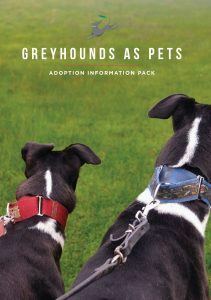 There are two ways you can adopt a greyhound from Greyhounds as Pets WA (GAP). One option is a Straight Adoption, in this model you are adopting a greyhound that has passed its Green Collar Assessment and spent a minimum of four weeks in foster care. This option is suitable for people who have specific requirements as to what they want their greyhound to have been exposed to, for example cats or other types of animals. The other path to adoption is to foster with the view to adopt, or what we call a Foster-to-Adopt. In a Foster-to-Adopt your greyhound will have passed its Green Collar Assessment, but will not have spent much (if any) time in a home environment. In this option you act as the foster carer for a period of four weeks, helping your greyhound transition to home life. After four weeks has passed we process the adoption. The Foster-to-Adopt model is a great option for people new to greyhounds and wanting to see if a greyhound will suit their family. It is almost a “try before you buy” model and during the foster period we supply everything you need for your greyhound and only process the adoption fee after the four week foster period. Foster-to-Adopt is also a great option for people wanting to start training their greyhound from day dot. Note: While your greyhound is in foster and until you have physically received your Green Collar from GAP your greyhound will be required to wear a muzzle when in public. You are able to download a copy of the comprehensive manual all adoptees receive as part of the adoption process here. Fill in the online application which tells us everything we need to know about you and your lifestyle. Wait patiently as we match you to your perfect greyhound. Your greyhound will come de-sexed, vaccinated, microchipped and vet checked. You will receive a lead, collar, worming treatment and a comprehensive document outlining your greyhounds’ history and personality. We offer a 28 day “road test” period for you to see if the greyhound fits with your family. During this period you can return the greyhound for a 50% refund of the adoption price. Our adoption fee is $350. GAP will provide you with a high level of support both during and after the adoption, with access to our Animal Behaviourist if needed. Wait patiently as we match you to a greyhound most suited to your family. Your greyhound comes vaccinated, microchipped and vet checked. Greyhounds in foster care can be booked into one of our supporting vet clinics to be de-sexed. GAP covers all costs associated with this vet visit. If you decide the greyhound is not the right fit for your family during the four week foster period you can return it to our kennels or try a different greyhound that may be more suited. The adoption will be processed after the four week period. Our adoption fee is $350.